I love shooting wood arrows. I still remember making them with my Dad before I was old enough to be in school. Two years ago my shooting went through, shall I say, a rough phase. I was breaking so many arrows I decided to shoot carbons, BUT JUST FOR THE SUMMER until my shooting got better. I ended up shooting carbons for over two years. This Spring I decided to go back to my first true love - woods. Part of the reason I chose to go back to wood is because I am still shooting the same two dozen carbon arrows that I made two years ago. I never broke any of my carbons! (I was shooting the CX Heritage arrows primarily) I really enjoy making arrows, and those danged carbons were robbing me from one of my favorite pastimes. Don't get me wrong, there are still times where I'll be toting carbons. I'm not a "purist", I don't get a tingle up my leg when I shoot woods, and I certainly don't think it has anything to do with...well...anything in regards to "traditional" archery. I just flat love wood arrows. I love making them, the smell of cedar, the straightening process, the limitless options of stain color, the bigger nocks, gluing on my points, and most importantly (because if you don't love this you have no business shooting wood arrows) - the smell of a broken arrow! When a woody gets broken in our group we pass it around so everybody can take a hit before discarding the fallen shaft. Buying wood arrows can be a huge pain. Wood is a natural material, obviously, and not consistent from tree to tree. Which in turn means that it is not consistent from arrow shaft to arrow shaft. The last set of wood arrows I bought without matching myself had a difference of 138 grains in physical weight. ONE HUNDRED AND THIRTY EIGHT! Before Tom started RMSGear he brought home, literally, 1,000 arrows at a time (up until 2010 Tom never killed an animal with anything but a wood arrow). I thought all those arrows were the coolest thing in the world when I was a little kid. Tom's supplier gave him a deal because Tom spent several days spine testing and weighing all 1,000 shafts. At the end of the process he picked out the ones he wanted and brought the rest back to his generous supplier. So when Tom started RMSGear he thought that one way he could serve his customers was to do all that laborious work for them. Which really meant that his teenage kids would do (and still do) all of that work. I kid of course, Tom spine tested more arrows in his first two years of business than I will in my lifetime. Danny spent the majority of Wednesday spine testing our latest batch of 1,000 arrows. His work is only half done though, because before these arrows will be ready to sell to our customers we will weigh them all. From there we will match them as close as we can in to batches of 12-14 arrows. 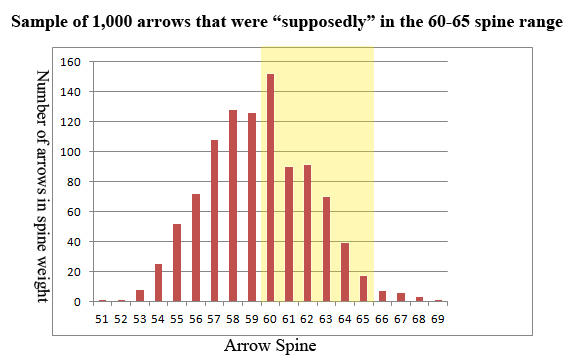 Of those 1,000 arrow shafts only 46% were within the spine range we thought we were buying. That's right, over half of them were wrongly matched. Here is a graph of the last box of arrows. I have highlighted the area that the arrows should have been within. You can see how unreliable the advertised spine was. I don't know what other wood shaft retailers do, but when you buy arrows from RMSGear we guarantee that you will be getting exactly what you ordered. Your arrows' spine will be within 2-3lbs and their weight will be within 10 grains. This is a time intense and mindless job, it will test your patience and your back, but the rewards are well worth it. If you enjoy the small reward only earned by the work of your hands, then I think you'll take pleasure in making and shooting wood arrows. Like I said above, I don't believe they are magical and I don't believe they make you more of a "traditional" bowhunter/archer. I do believe they are fun and enjoyable, and I do believe there is something about using items that your own creativeness and labor brought to fruition. Like always, this sport is our passion, and we love nothing more than to help others get in to this wonderful tradition. Please pick up the phone and give us a call or shoot us an Email if you have questions or interest about making your own arrows.